buynow/bloglater: Dior Addict Eau Delice! I have mentioned before how I love the diffusion scents that perfume houses bring out this time of year. The spin-offs from the flagship fragrances are always lighter, younger, fresher and prettier. Dior Addict Eau Delice is the latest one that I have tried and it fits that description quite accurately both in terms of look and actual scent dry down. 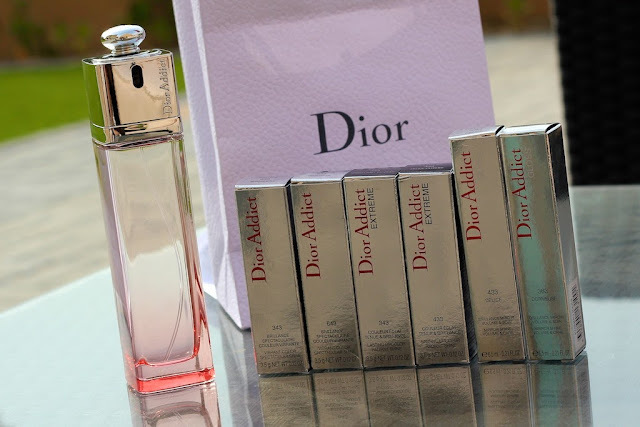 Picture below: Dior Addict Eau Delice and a collection of lip products that gave me heart palpitations. Now lets get this out of the way first. I don't love the original. It's nice, it's okay but if you asked me to describe what it's like I couldn't tell you. It's just not that special or interesting on me. So I really wasn't sure I would like this. The rose-ombre bottle is stunning but what about the stuff in it? 1) The initial spray on the skin reveals something completely unremarkable. It doesn't smell unique or interesting but instead smells quite generic - musk, jasmine and fruits. It's not horrid but it's certainly not "wow" either. But...then the dry down happens. I think the fruit factor is crucial because that note combination could easily be too musky/Grandma but sweet notes keep it fresh. 3) Longevity is average. It's not a determined lingerer but a spray every 6 hours or so keeps it topped up nicely. And I really don't mind doing that. PS. I don't want to offend anyone with my comments on Dior Addict (original). As you know, it's all about how your body chemistry reacts to the notes etc.! You are so good at describing scents Laura! This sounds lovely, I will definitely have a sniff! I love your reviews Laura, refreshingly honest. I'm loving Chanel Chance Eau Fraiche at the mo! by the way, please show us your lippies! The dry down sounds absolutely delish! I love gourmand scents. This sounds lovely. I need to find a perfume counter or a Dior Counter and sample this. Like you, I'm not a massive fan of the original, so I'm intrigued to see what this version smells like. Also not a fan of the original. Love the eau fraiche version more than this one though! Its definitely worth a sniff!! it sounds lovely ! the scents are well described ! The first thing you'll need when it comes to writing an academic essay is patience.Ordinarily talking, these sorts of assignments are not things that you can do the night before they are expected. You have to comprehend that particularly with scholarly papers.